Firehouse Productions continues to play an expanding role in the NBA All-Star Weekend communications infrastructure, building out and maintaining a communications network based on the Riedel Artist digital-matrix intercom system. All told, Firehouse managed almost 1,000 carriers, 90 channels of communications, and more than 400 communication devices, including hard-wired systems, master panels, and wireless beltpacks. 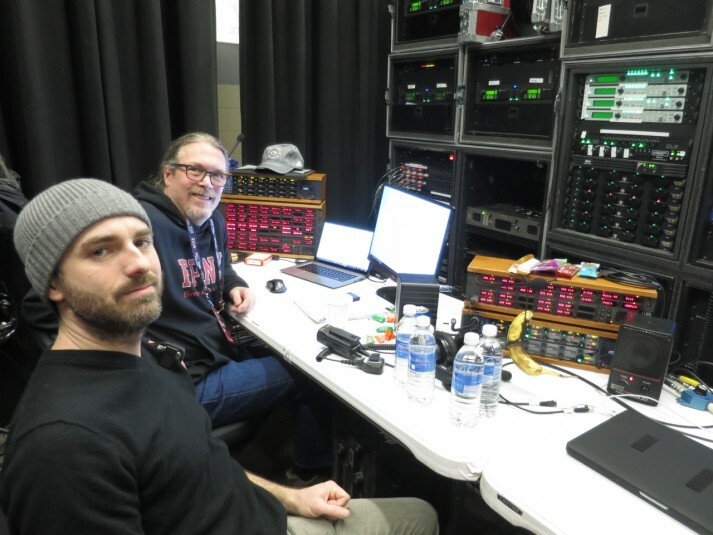 Firehouse Productions’ Vinny Siniscal (left) and Gaff Michael helped oversee a new, unified communications network at the NBA All-Star Game in Toronto. This marked the third year that Firehouse was involved with the event, and the team included Gaff Michael, Riedel programmer; system architects Brian Hurst and Stephanie Celustka; and Luis Espinal, who handled wireless/communications integration. The major advance this year was tying in the Turner Sports intercoms, allowing anyone involved with a portion of the massive three-day event to easily communicate with anyone else. The Firehouse system basically pulled together communications from the TV-production team, the live-entertainment team, and even the in-house production team. Siniscal and a Firehouse Production team of nine staffers were based inside the Air Canada Center. Firehouse Productions handles such systems for a wide range of clients, from the live hit during the Grammys of a performance of Hamilton to massive corporate events. The distributed intercom-over-fiber system had full redundancy and was under the control of a simple graphical user interface that makes it easy for the Firehouse Productions team to meet the needs of each production team. Riedel not only provides the technical backbone but is also a kindred spirit in terms of corporate philosophy with respect to redundancy, reliability, and scalability. The company’s RockNet real-time, low-latency audio-distribution network is also put to use, allowing the Firehouse Productions team to build out a network for each unique situation.